With profile videos, users will be able to add a new dimension to their profile by including a short, looping video clip that plays for anyone who visits the user’s profile. 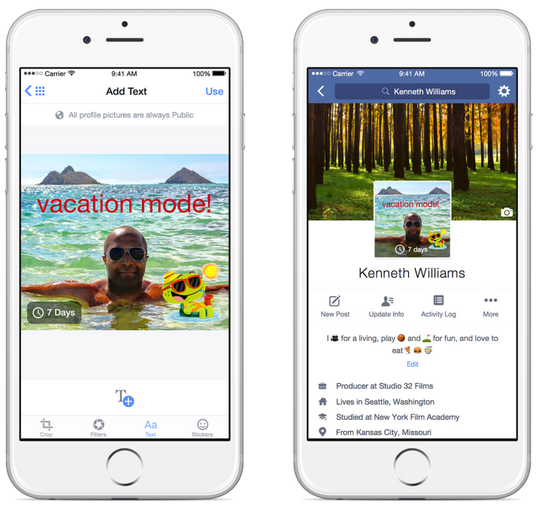 In addition, Facebook unveiled a new profile picture feature that allows users to set a temporary version of their profile picture that reverts back to their previous picture at a specified time. For instance, someone could temporary change their picture for throwback Thursday (#tbt), or to celebrate a vacation (see image). In addition to the profile design changes, Facebook announced new profile controls that enable users to change the visibility of the fields that are shown at the top of their mobile profile. For example, users can select what “About” details appear, and choose five featured photos to be showcased. 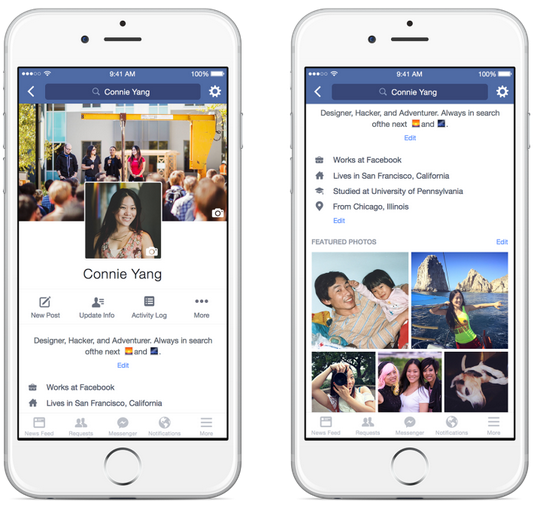 Plus, Facebook introduced a new, one-line bio space where users can describe themselves. Facebook also revealed that it is moving mobile profile pictures and videos to the center of a user’s profile as well as making these images bigger. Additionally, the social network is making it easier for users to see mutual friend photos when visiting someone’s profile. All of these updates are currently being tested by a small number of iPhone users in the UK and California, but will be rolled out to more people soon.